The Navratri celebrations have become a cause of worry to many people, with more than 200 people in northeast and east Delhi, landing themselves in hospitals after consuming adulterated buckwheat flour (kutu atta) on the first day. Union minister of housing and urban poverty alleviation Kumari Selja at a meeting held today decided to make Delhi slum-free within a specified timeframe. Over 500 hutments were gutted after a fire broke out in a slum in north Delhi in the early hours of Tuesday. No casualty was reported, a fire brigade official said. A suspended cabin crew staff of erstwhile Sahara Airlines has been arrested for allegedly duping aspiring pilots on the pretext of arranging airline jobs for them. Sagar Bhasin, 32, who lived in posh Panchsheel Enclave, had allegedly taken money from aspiring pilots on the promise that he would get them jobs through his contacts. The special staff of the east Delhi police has busted a gang of cheats for duping people of various states on the pretext of getting mobile towers erected on their lands. Teach blind students for an hour a week for one year - this was the order of the Delhi High Court on Tuesday to two Delhi University final year students of Ramjas College in exchange for quashing a police complaint against them for being involved in a group clash two years ago. A Delhi court today sentenced two youths to life imprisonment for crushing to death a policeman under their tempo and seriously injuring another in a bid to flee with the beef-laden vehicle. A special Central Bureaue of Investigation (CBI) court today allowed Surender Koli, one of the main accused in the sensational Nithari killings case, to have a lawyer of his choice. Even as the Delhi High Court has come down heavily on tobacco shop owners selling cigarettes and other tobacco products near colleges and schools in the Capital, most college students are least bothered and seem to be managing cigarettes on campus pretty easily. Much like every year, the Municipal Corporation of Delhi (MCD) has promised that there will be no waterlogging on the roads of Delhi in the coming monsoon season and has started desilting of drains in advance. The Delhi Jal Board (DJB) today announced that due to some repair works going on in the main water supply lines, the supply will be affected in parts of north-east Delhi tomorrow. City's hospital authorities said all the patients, brought to hospitals with giddiness, abdominal pain, diarrhoea and vomiting remained stable and many of them had been discharged, while others were kept under observation until late in the evening. Since yesterday's intervening night as patients were rushed to four government hospitals-Dr Hedgewar Hospital, Guru Tegh Bahadur Hospital (GTB), Lal Bahadur Shastri Bal Chikitsyalaya (LBS) and Jag Parvesh Hospital, the incident has caused a fear among Delhiites, with similar cases reported from the neighbouring areas. "We had our dinner and nothing seemed to be wrong until many in my family started complaining of a headache and they vomited. I didn't delay and with the help of neighbours took them to nearby Hedgewar Hospital where we found several people with similar problem," said Ram Prakash, who lives in Gandhi Nagar. In the Capital, the first few cases were reported from Hedgewar where affected patients were brought in to the casualty around 2 am. "When we received cases initially, we thought it to be routine ones related to the gastric problem and stomach upset. But later, we realised that it was a different problem. We received a total of 76 patients and out of which 32 have been discharged after first-aid, while the remaining 44 are under observation. At 8 pm after another review, we would be deciding about their discharge," said medical superintendent of Hedgewar Hospital, Dr P Raju. The scene was no different in other hospitals where patients from areas such as Nandnagri, Vishwas Nagar, Laxmi Nagar, Azad Nagar, Trilokpuri, Gokalpuri, Jagatpuri, Gandhinagar, Kalyanpuri and kichdipur started pouring in the casualties. "Until evening, we have received a total of 77 patients and all of them were managed with IV fluids to maintain the hydration level besides the other treatment as per the requirement. There is nothing to worry and all of them are stable," said the GTB's chief casualty medical officer, Dr J P Kapoor. According to the latest update (around 7:30 pm), among the 58 patients admitted to LBS, 49 had been discharged until 4 pm, while one patient was admitted to Jag Parvesh Hospital. "The patients started coming to us around 7:30 in the morning with abdominal pain and vomiting. They were given the necessary medication and the majority of them have been discharged," said LBS' medical superintendent Dr Vir Singh. Delhi health minister A. K. Walia today directed the Prevention of Food Adulteration (PFA) department to conduct an inquiry into the incident of adulterated 'kuttu atta' in East Delhi that caused food poisoning to a number of persons. While conducting the inquiry, sleuths of the department raided shops that keep the flour and ceased a godown in Mandowli that supplied kuttu atta to the trans-Yamuna area, Walia said. The minister also instructed the department to lift samples in large numbers in the capital city. He also asked the sub-divisional magistrates to co-operate in enforcing the existing PFA Act which is to be replaced by the new Food Safety and Standard Act 2006 within the three months. Giving details of the new Act, Walia stated that all the food business operators would have to get themselves registered or licensed. The petty shopkeepers that have an annual turnover of Rs 12 lakh have to get their establishments registered with the health department while the big traders have to get a licence. Under the new law, the punishment has been divided into two categories. In case of substandard, misbranded food or misleading advertisement about the food products, the cases will not go to the court. Only a fine will be imposed up to a maximum of Rs 10 lakh. In case of unsafe food, the punishment will be imprisonment up to seven years with a fine of Rs 10 lakh. In case of death caused due to adulterated food items, the punishment will be imprisonment for seven years and maximum life imprisonment and a fine up to Rs 10 lakh. In case of death, compensation will not be less than Rs 5 lakh while in case of grievous injury, it will not be more than Rs 3 lakh and in case of minor injury, it is not more than Rs 1 lakh. The police has detained several people in connection with the food poisoning of over 200 persons after they ate items made from buckwheat flour (kuttu atta) in east and northeast districts. "But it would be premature to say that the mill was the only source of the contaminated flour. We are investigating and will take more time to reach the guilty," an investigating official said. "They purchased the flour which was not packed. Nandu Masala Mill, Mandawali, has been found to be the manufacturer of the flour consumed by most of the victims," a senior police officer said. The police is conducting raids in the area and the district administration and the food and adulteration department have also taken samples for test. A police spokesperson said they had detained some persons. The district administration and emergency services have been alerted so that they be prepared if more people fall victims to it. A high-level committee with officials drawn from all the departments concerned will be constituted to draw up a time-bound action plan and suggest the necessary reform measures to be taken for inclusive urban planning of Delhi. The committee will be chaired by the secretaries of the ministries of urban development, housing and urban poverty alleviation. The committee was also mandated to suggest coordination mechanisms for ensuring timely implementation in view of the multiplicity of agencies in Delhi. It was decided that the minister of housing and urban poverty alleviation and the Chief Minister of Delhi would review the progress on a periodic basis to ensure effective implementation. The major issues discussed in the meeting were the requirement of giving legislative backing to the reform of earmarking funds into a non-lapsable BSUP (Basic Services for Urban Poor) Fund for the urban poor, effective implementation of the pro-poor provisions of the Delhi Master Plan with respect to reservation of 15 per cent of the floor area ratio (FAR) or 35 per cent of the dwelling units for economically weaker section (EWS) or low income group (LIG) in all the group housing projects. The action plan would be implemented with the involvement of the community and residents welfare associations (RWAs). Other key decisions of the meeting were the creation of large-scale rental housing stock in the form of dormitory housing, housing on hire purchase etc. It was also decided that measures for improving access of urban poor to housing finance by involving financial institutions would be undertaken. While discussing the progress of ongoing slum redevelopment project of DDA and MCD, it was decided that these agencies would ensure speedier implementation of existing projects and also simultaneously prepare plans for scaling up projects related to creation of affordable housing stock. Delhi Urban Shelter Improvement Board was directed to prepare innovative pilot projects of slum redevelopment and creation of affordable housing stock in the next three months. 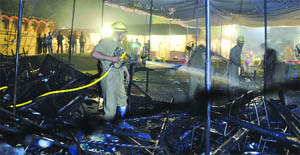 "The fire broke out in jhuggis near Rithala Metro station around 1.05 am on Monday night. Nearly 22 fire tenders were rushed to the spot, and the blaze was doused within an hour," the official said. A suspended cabin crew staff of erstwhile Sahara Airlines has been arrested for allegedly duping aspiring pilots on the pretext of arranging airline jobs for them. Sagar Bhasin, 32, who lived in posh Panchsheel Enclave, had allegedly taken money from aspiring pilots on the promise that he would get them jobs through his contacts. A promising youngster, he studied in a reputed school and graduated from Delhi University. The police said he had represented Delhi in the Under-15 state-level football tournament. He joined Air Sahara as a cabin crew at the age of 22. He worked there for six years and was drawing a good salary when he lost the job after he became overweight. It was then that he turned to crime. Bhasin still possessed security and identity cards of his earlier establishments and did not surrender them to the agency concerned at the time of quitting to keep his contacts alive, the police said. Investigation is being done to know his contacts, if any, in the civil aviation ministry. H.G.S. Dhaliwal, DCP (south), said his experience as a crew member came handy for him in beguiling youngsters who wanted to be pilots or land other well-paying jobs in the airline sector. The police learnt about the racket after Navneet Bhutani of Gurgaon, who ran a medicine shop in INA Market, brought it to its notice. Dhaliwal said Bhutani met Bhasin over a month ago at his medicine shop. He had introduced himself as a pilot with Jet Airways. Bhasin told Bhutani that he had very good contacts in the civil aviation ministry and could arrange a job for someone. Bhutani got impressed with Bhasin's suave personality and approached him for a job for his cousin, Ashish, who had taken a commercial pilot's licence from the USA. Bhutani paid him Rs 2.30 lakh three weeks ago. But he got suspicious when Bhasin demanded Rs 2 lakh more, yesterday evening. The police said on the complaint of Bhutani, it registered a case of cheating against Bhasin. He was arrested last evening. A loaded automatic pistol was recovered underneath the driver seat of his car, the police said. The police said Bhasin was likely to have duped more people . Bhasin last year visited his farmhouse in Madhya Pradesh and procured two pistols. He was arrested by the Chankiyapuri police a few weeks ago for carrying a pistol and remained in jail for over two weeks. The second pistol, which he did not disclose that time, has now been seized from his vehicle. He carried the pistol to impress people. The police said it arrested five persons-- Islam Ahmad, Deepak Kumar Malhotra and Mukesh Kumar from west Vinod Nagar; Suraj of Mandawali and Tilakraj of Ajmeri Gate. The accused used to give advertisements in some leading newspapers of Punjab, Haryana, Uttar Pradesh, Madhya Pradesh, Maharashtra and other states asking anyone who had sufficient land and wanted to get mobile towers installed on it for commercial purpose to contact them. "The interested customers were asked to provide certain details, after which forged letters with fake speed post stamps were sent to them. The gang mostly tried to convince its victims to erect towers of Virgin, Idea and Aircel companies. In due course of time, the gang members contacted the victims and asked them to deposit a registration fee in their accounts, opened on forged papers," the police said. When the land owner deposited the money, which used to be between Rs 4,000 to 5,000, the accused dispatched fake set of agreement letters to the victims. "In the agreement letter, the victim was promised Rs 65,000 to Rs 70,000 monthly rental and Rs 40 lakh as advance payment by the company. The accused would then ask the victims to deposit Rs 43,000 as tax in their account," the police said. The accused had more than 100 accounts in fake names with ICICI Bank, Punjab National Bank, State Bank of India and State Bank of Patiala, the police said. The police acted against the accused after it received secret information that they were running an office in Acharya Niketan Market, Mayur Vihar Phase-1, where they met people interested in getting mobile towers installed on their land. All the accused were apprehended from the spot. The police has seized 180 mobile phones, fake stamp papers, agreement letters of different mobile companies, job letters, government seals and many other incriminating documents. Justice Hima Kohli in her order said: "One year service to visually challenged students in Delhi University campus. Teach them for one hour in a week, but you have to do this for full one year." The court also said that the two can start teaching the blind students after their final year exams, due in May, are over. The court passed the direction on the petition of six Ramjas College students who sought quashing of the FIR against them registered at Maurice Nagar police station under various criminal sections of the Indian Penal Code and under sections of Prevention of Damage to Public Property Act. On September 3, 2009, two groups of students got into a fight at Ramjas College hostel. The FIR was lodged the next day. "In one group there were four students and the other group had only two members," said the petition. The group of four students lodged an FIR against the two, who filed a cross-FIR against them. The six students then approached the court for quashing the FIR. However, the court has only quashed the FIR against the two students. "Quashing of FIR against the four will be heard on May 3," said the court. Additional sessions judge Virender Bhat convicted Saleem, 28, and Azim, 22, of murder and attempt to murder charges, observing that the two men had intentionally hit the police control room van, killing head constable Naresh and injuring assistant sub-inspector Jagpal. "Keeping the overall facts and circumstances of the case in view and considering the age of the accused, they are sentenced to imprisonment for life," said Bhat while also imposing a fine of Rs 15,000 each on the convicts, both natives of Bijnore in Uttar Pradesh. The court, however, rejected the prosecution's plea to award death sentence to them, saying that the case did not fall under the rarest of the rare category. "In my opinion, the case does not come under the category of the rarest of rare cases. Therefore, the appropriate sentence to be imposed upon the two accused would be life imprisonment," the court said. The incident took place in the Kapashera area of south-west Delhi on September 9, 2008 when the accused rammed their beef-laden tempo into a PCR van in a bid to escape from the police. The court acquitted two other UP natives-- Aas Mohammed and Mohammed Naushad. The fifth accused, Potia, a resident of Delhi, is yet to be arrested and has been declared a 'proclaimed offender'. On March 31, Koli in his application told the court that the defence lawyer provided to him by the government is not competent enough to deal with his cases and due to the advocate's incompetency, he was sentenced to death in some of the several cases registered against him. Special judge Shyam Lal allowed Koli's plea for a new defence lawyer. The court today appointed advocate Subodh Tyagi as amicus curiae for Koli. D-school or the Delhi School of Commerce and Economics has always been known for its famous lemon tea for Rs 5 and the delicious yet economical lunch at the canteen. But one of the features of D-school is that it can be dubbed as the "smoker's paradise" at DU and most students, including non-smokers, have no problem whatsoever with it. "Even as there are restrictions, cigarettes are available near colleges. We all smoke at the D-school grounds very often. That has been the place to sit and smoke without anyone having to worry. Teachers and professors pass that stretch all the time," said one of the sociology students at D-school, requesting anonymity. Just five days ago, the Delhi High Court directed the Delhi police to take the strictest possible action against those selling tobacco products within the prohibited 100-yards near schools, colleges and hospitals. Any vendor caught selling tobacco products near these places would have to face a penalty ranging from a fine of Rs 1,000 to three months' imprisonment. Even Delhi University was asked to appoint as many as 100 nodal officers to spot any violation within the campus. However, several areas in DU continue to be smoking hubs, including D-school. Similar is the story of Jawaharlal Nehru University where even as there are no cigarettes sold on campus, there is a cigarette shop bang opposite the main gate. On days of special raids and checks, the small shop or "khoka" is usually missing, but students know when and how to spot their favourite cigarette shop. "We cannot buy cigarettes inside, but we can buy them everywhere outside. We smoke inside hostel rooms or at JNU dhabas. I think it is a personal choice and of course, restrictions should be put to prevent passive smoking," said Poorvi, one of the residents at Godavari Hostel, JNU campus. However, many feel that restrictions should definitely be put around schools as young students start smoking as early as in class VII. "My concern is for the younger students in schools who pick up this habit very early. Proper monitoring is a must and some restrictions will be useful on college campuses as well. One's lifestyle choice shouldn't affect someone else's life," said Kavita Sethi, a professor of linguistics at JNU. Taking into account the problem of waterlogging faced during the monsoon season, the MCD has intensified its drive to de-silt the drains much in advance. "The civic agency has already completed 56 per cent of the work," said a senior MCD official. Out of a total of 1,524 drains in the civic body's area, the MCD had proposed to remove nearly one lakh metric tonnes of silt between July 2010 and July 2011. More than 56,000 metric tonne silt has already been cleared. In zones like Sadar, Paharganj and South, more than 70 per cent of the work is over and in the Central zone, the target for this year has already been met. The MCD had procured special equipment for desilting of drain before the Commonwealth Games last year and one round of de-silting was completed in February. The ongoing second round will be completed in June. Not only this, for better coordination and more effective de-silting of drains, the civic body had transferred all the works related to the cleaning of drains to the department of environment management services (DEMS) in three of the 12 municipal zones. "Due to urgent repair work in Jal Vihar main water lines at Yamuna Vihar and Narwana Road in Mandawali, water supply will be affected on the evening of April 6 and morning of April 7," said a senior DJB official. The areas affected will be: D and E blocks of Preet Vihar, West Vinod Nagar, Mandawali Societies, Patparganj Societies, IP Extension, Railway Colony, E and F blocks of Mandawali, Vikas Marg, Ramesh Park, Laxmi Nagar, Krishan Kunj, Shahdara and phases I and II of Mayur Vihar, he said. "Residents are advised to store sufficient water," said the official.